Introducing the versatile range of PLA (poly lactic acid) containers made from corn starch. 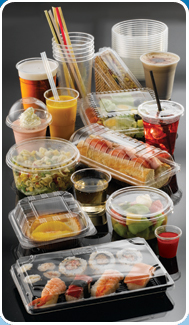 Not only are PLA products biodegradable, they are practical, food safe and attractively designed for the busy catering and foodservice environment. PLA products are available transparent or coloured and the range includes items suitable for most needs. What's more all the products from the GoodLife PLA range are fully biodegradable and can return to nature in just a matter of weeks. PLA (ploylactic acid) products are made from corn starch and are fully compostable within 50 days in commercial conditions. They are suitable for cold drinks and fresh food only (up to 50C), with the exception of our two hot cup products.